Discussion of tundra vegetation is focused mainly on zonal associations, that is, natural vegetation that reflects macroclimatic conditions and develops on watersheds or plakors (a term used in the Russian-language literature to describe flat or slightly sloping, well-drained areas). Intrazonal vegetation occurs in various habitats different from those of plakors, such as stream valleys, depressions, or slopes. In tundra, these are herb-grass meadows which develop mainly on south-facing slopes and in river valleys, herb-moss or lichen-moss snowbed communities. The most widespread non-plakor habitats are mires, a type of bog most common in the northern regions of Russia whose formation and existence depends on high ground moisture content due to permafrost. Biota of the tundra zone is discussed in many publications including those published in English by Chernov (1985) and Yurtsev (1994). The subzone of the arctic tundra occupies the Yamal, Gydan, and Taymyr peninsulas, the southern island of Novaya Zemlya, Vaygach, Novosibirskie, and Wrangel islands and develops locally along the shores of the Anabar and Kolyma rivers (Figure 8.9). At its southern border the mean July air temperatures do not exceed 5°C. The northern forest limit, which oscillated in postglacial time, never crossed this border and the present-day arctic tundra zone remained treeless throughout the Holocene (Aleksandrova, 1980). An important feature of the arctic tundra landscapes is an abundance of bare ground. In some regions, however, a continuous vegetation cover occurs such as, for example, in north-western Taymyr and northern Yamal. Mosses are abundant and, in contrast to polar deserts, predominate among the cryptogams. Mosses play an important role in the tundra environments because they control soil temperature and moisture. Under the moss cover and a layer of peat, which is produced by the disintegrating lower part of the sward, mineral ground is barely heated and ice lenses are present throughout summer. Moss cover prevents the development of thermokarst and helps to stabilize vegetation. During spring, mosses absorb moisture, creating bog-like conditions; in summer they prevent the upper layers of soil from drying out. Flowering plants and dwarf willows root in the moss cover and horizontal development of roots within the moss sward is a typical feature of tundra plants. In contrast to the typical tundra, shrub species are lacking from the arctic tundra and only dwarf willows (Salix polaris and S. arctica) and Dry as occur. The majority of plants are less than 10 cm tall. As in polar deserts, an intimate relationship exists between cryogenic processes and vegetation, especially with regard to soil cracking in habitats with scanty snow cover. Where soil is broken into polygons, vegetation develops as net-like strips along the cracks between polygons. These environments are known as polygonal tundra. Another type of tundra, spotted (medallion) tundra is formed by patches of bare ground (with very sparse vegetation or sometimes covered with crustaceous lichens) surrounded by borders raised to 5-10 cm with a well-developed moss sward. A shallow trench filled with peat and mosses mixed with flowering plants occurs between two adjacent spots. In spotted and polygonal tundras bare ground occupies up to 50 per cent of the surface (Chernov, 1985). The diameter of bare spots is larger than in polar deserts, about 40- 50 cm and, in contrast to polar deserts, the root systems of plants are close under the bare spots. The differences between provinces and subprovinces in the arctic tundra are less well expressed than within the subarctic tundra which is related to the more uniform composition of the flora in higher latitudes (Young, 1971). Aleksandrova (1980) identifies three longitudinal provinces: (1) Novaya Zemlya — West Siberian — Central Siberian; (2) East Siberian; and (3) Wrangel island (a subprovince within the Chukotka province). The major difference in species composition between west and east is a wide occurrence of Carex ensifolia ssp. arctisibirica westwards of the Indigirka and its small role in zonal habitats at the same latitudes in the east. There is a strong increase in the number of Siberian species from west to east resulting from the increasing continentality and approach to the Asiatic centre of species origin. In the westernmost subprovince, at Novaya Zemlya and Vaygach, spotted tundras (surface coverage between 40 per cent and 70 per cent) dominate because of the active cryogenic processes resulting from a relatively high amount of precipitation and a deep active layer. Tussock association with Deschampsia brevifolia is endemic to this subprovince (Aleksandrova, 1980). Further east, at the Yamal, Gydan, and Taymyr peninsulas, tundras with closed vegetation cover (up to 98 per cent coverage) exist alongside the spotted tundra. Dryas tundras are widespread on loamy soils while westwards they occur only on stony grounds. Eriophorum angustifolium, which at Novaya Zemlya relates only to mires, appears as an admixture in zonal associations. The flora in general assumes a Siberian character; at Novaya Zemlya the Siberian species account for 12 per cent and amphi-atlantic species constitute 8 per cent, in the Yamal – Gydan — Taymyr subprovince the amphiatlantic element occurs only exceptionally. The transition to the East Siberian province is manifested in the disappearance of Carex ensifolia ssp. arctisibirica. The arctic tundra of the Novosibirskie islands is represented mainly by herb-dwarf shrub-moss associations. Associations with a predominance of Salix polaris, Alopecurus alpinus, and mosses, in which Luzula confusa sometimes codominates, are endemic to the province (Aleksandrova, 1980). Surface coverage varies between 50 per cent and 65 per cent of which most is accounted for by Salix polaris. 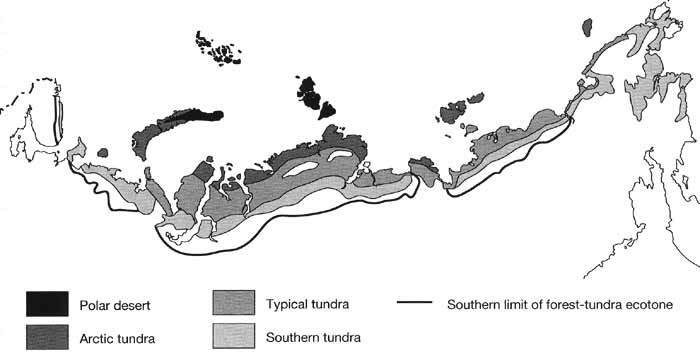 In more exposed locations with a thin snow cover, polygonal tundras develop with 15-40 per cent coverage. Dryas tundras with a coverage of 80 per cent are typical of habitats protected from wind. Poppies are abundant across the islands with their numbers reaching 40 flowers per m2 (Aleksandrova, 1963). An unusual flora has developed on Wrangel island due to two main factors: first, the island was not completely glaciated during the ice age and, second, periods of its isolation alternated with the connection to Beringia during the time of maximum shelf exposure (Yurtsev, 1974a). As a result, the island flora became rich with Beringian and Angarian species, while the periods of isolation contributed to the development of endemism. Circumpolar species constitute only 45 per cent of the island flora, compared to 63 per cent on the Novosibirskie islands, and 3 per cent of flora is endemic while on the Novosibirskie islands there are no endemics. Endemics are most abundant in the genera of Papaver and Taraxacum (Yurtsev, 1994). About 400 species of vascular plants, more than in the whole of the Canadian Arctic archipelago, are known on the island which is unusual for this high latitude location and the small size. As its name suggests, the subzone of typical tundra is most characteristic of tundra landscapes. It occurs in the Taymyr, Yamal, Gydan, and Yugorsky peninsulas, and between the rivers Yana and Kolyma, although it is best represented in the Taymyr peninsula (Figure 8.9). The southern boundary of the subzone runs along the July isotherms of 8-10°C. The typical tundra is a realm of mosses which form an unbroken thick carpet covering the ground. The moss sward measures from 5 cm to 12 cm (Chernov, 1985). The most typical species are Tomenthypnum nitens, Hylocomium splendens, Aulacomnium turgidum, and Rhacomitrium lanuginosum. Lichens are an important admixture to the moss sward and some areas have up to 200 species (Chernov and Matveeva, 1979; Matveeva, 1994). The herbaceous tier is dominated by sedges of which Carex ensifolia ssp. arctisibirica is most common. Sedges are the second most important plants in the typical tundra vegetation and basic zonal association is often referred to as sedge-moss tundra. Other common species include Eriophorum, Saxifraga, Pyrola, and shrubs and dwarf shrubs such as species of Salix, Dryas, Cassiope, and Vaccinium. The height of shrubs seldom exceeds 40 cm and tall bushes are absent from watersheds. This is because only those plants that are covered by snow can survive winter as a result of snow abrasion, whereas the snow melts away around branches which are subsequently abraded by wind. Snow abrasion does not affect all species to the same extent. For example, Alnus, reaches a height of about a metre on slopes which exceeds the snow depth. Within the typical tundra subzone, spotted tundra occurs in elevated localities where completely bare patches (about 20 per cent of the surface) alternate with patches covered with mosses and flowering plants. In the spotted tundras of Taymyr, between 30 and 60 patches of bare ground occur per 100 m2 (Bliss and Matveeva, 1992). Taymyr is characterized by a high number of high Arctic species. However, Betula nana appears in prostrate form on watersheds as well as thickets of Salix lanata, which indicates that the tundras of this region belong to the subarctic type. In eastern Taymyr, between the rivers Khatanga and Olenek, the typical tundras are represented by creeping shrubs (Betula exilis, Salix pulchra, S. repens) which are not more than 20 cm tall. The northernmost forest 'island' is located at 72°30'N in the valley of the river Novaya, the Khatanga's tributary. It is formed by Larix gmdinii which has short stems and thick branches flattened to the ground and submerged in the moss sward. Further east, between the rivers Yana and Indigirka, hummocky tundras dominate, with Ledum palustre, Vaccinium uliginosum ssp. microphyllum, and V. vitis-idaea being the main species (Andreev, 1975). The southern tundra is characterized by a tier of bushes about 0.5 m high developing on watersheds. Although there is a lack of real tree vegetation, individual trees, mostly Larix, occur in zonal habitats and patches of woodland penetrate into the southern tundra along rivers. Boreal elements of flora play an important role in vegetation cover which makes the southern tundra similar to the forest-tundra ecotone. The bush tier consist mainly of Betula, Salix, and Alnus. Rich grass, shrub, and dwarf-shrub vegetation develops in the shelter of bushes. Bryophytes form a continuous cover and are represented by many species. Often, thickets alternate with shrubless mossy tundra. Patches of bare ground occur although they are less widespread than in the typical tundra. Different vegetation associations form in response to local controls such as topography and moisture availability. Meadow associations develop in river valleys; tundra-steppe associations are typical of arid north-eastern Asia. Distinct provincial differences within the southern tundra subzone have formed in response to variations in the contemporary and Pleistocene climatic conditions. The extent of glaciation, submergence during the marine transgression, and existence of land bridges allowing floristic exchange are the main factors responsible for the formation of three provinces: East European — West Siberian which was glaciated, East Siberian and Chukotka which were never completely glaciated (Aleksandrova, 1980). Typical of the East European — West Siberian province is a wide distribution of dwarf birch Betula папа associated with forest mosses and associations of В. папа with admixture of Carex ensifolia ssp. arctisibirica, not met in the other provinces. In comparison with the eastern provinces there is a distinct lack of xerophilous species, high saturation with boreal species, and European, Atlantic, and amphi-atlantic species many of which occur in the mountains of Central Europe. In the Kola peninsula subprovince, tundra forms a narrow strip running along the coast. Shrubby tundra is formed by Betula папа which is about 70 cm tall with admixture of Salix glauca; associations with a dominance of Empetrum hermaphroditum and Vaccinium myrtillus are typical of dwarf shrub and dwarf shrub-lichen tundras. The tree line is formed by Betula tortuosa and Pinus lapponica. Vegetation of the Kola peninsula is closely related to the mountainous tundras of northern Scandinavia (Koroleva, 1994) and resembles the vegetation of the subarctic in Greenland (Aleksandrova, 1980), which may be connected to the supposed existence of a land bridge between Europe and southern Greenland in the late Pleistocene over the Faeroes and Iceland. The eastern part of European Russia, between the White Sea to the Polar Urals, is dominated by tall-growing tiers of Betula папа (up to 1 m high) with admixture of Salix, thick moss swards, and some dwarf shrubs (Aleksandrova, 1980). Tundras with sparse growth of willows alone are typical of the northern regions of the East European subprovince (Kolguev island and the southern part of Vaygach). The tree line in the subprovince is formed by Picea obovata. Further east, in the Yamal — Gydan — Taymyr subprovince, Alnus fruticosa appears as a typical admixture to dwarf birch and willow associations; the forest line is formed by Larix sibirica. Tussock tundras, formed by a typical of this subprovince association of Eriophorum vaginatum with Carex ensifolia ssp. arctisibirica, develop in habitats with impeded drainage. The transition between the East European-West Siberian province and the East Siberian province is expressed in the replacement of Betula папа by B. exilis. Diminishing thickness of snow cover, appearance of frost wedges, and microrelief forms associated with cryogenic processes leads to the development of spotted tundras. Dwarf shrub and herb dwarf-shrub tundras dominate with lichens being more important than in the western regions. The tree line is formed by Larix gmdinii in the west and Larix cajanderi in the east. Amphi-atlantic species disappear and amphi-beringian species begin to mix. Glaciation of Eastern Siberia and the Chukchi peninsula was not complete and vegetation maintained a connection with the ancient Pleistocene flora. Thus the tundra-steppe associations typical of the Chukchi peninsula province are relicts from the cold and dry Pleistocene epoch (Yurtsev, 1972, 1974a, b). Carex duriuscula, otherwise typical of the steppes of Southern Siberia and northern Mongolia, occurs here, as well as Helictatrichon krylovii and other steppe, meadow steppe and mountain steppe species. The dominating type of tundra in the Chukchi peninsula province is tussock tundra with Eriophorum vaginatum and Carex lugens (Katenin, 1974). The tree line is formed by Larix cajanderi with Chosenia arbutifolia and Populus suaveolens penetrating far north along rivers. A typical feature of the tundra landscape are bogs and mires which cover 32 000 km2 in the arctic tundra and 560 000 km2 in the typical and southern tundra subzones (Bliss and Matveeva, 1992). They develop on lowlands and coastal plains, in depressions between watersheds and along rivers. Three main types are distinguished: homogeneous mires, flat-topped hummocky mires with wet depressions and peat hillocks, and polygonal mires. In hummocky mires, groups or rows of flat-topped peat hillocks develop. They are made up of peat formed by the mosses growing on them and may reach 10 m in diameter and over one metre in height. Hummocks are separated by wet or water-filled troughs. Polygonal mires consist of 50-100 polygons, 5-10 m across. The central parts of polygons, flat or concave, are bordered by rims elevated over the centre by a few tens of centimetres. These are the so-called low-centred polygonal mires. Due to the level topography an abundance of mires and lakes exist in Yamal, Gydan, and western Taymyr (Boch et al, 1971; Matveeva, 1994). Cryogenic forms of relief promote the development of polygonal mires in the Yana, Indigirka, and Kolyma river basins and Novosibirskie islands. The enormous tetragonal mires develop in Novosibirskie islands with stagnant water in the low-centre polygons. Mire vegetation is intrazonal and often forms inclusions atypical of the tundra plant communities developing on watersheds. A more detailed discussion is given in Bliss and Matveeva (1992).